For 100 years now, Switzerland's Pro Juventute Foundation has worked to meet the needs of children and their parents. Pro Juventute is Latin meaning "For the Children." Each year at Christmas, in coordination with the Swiss Post, semi-postal stamps and philatelic products are sold to raise money for the organization. 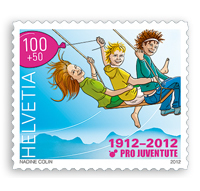 The attractive topical stamps and well-meaning intentions of Pro Juventute combine to make these issues favorites with the Swiss public and stamp collectors around the world. Both the foundation and the stamp issuing tradition arose simultaneously in 1912 as part of an anti-tuberculosis campaign. Tuberculosis had been a major global scourge in the 19th century, responsible for as much as 25% percent of all deaths in Europe. A disease of the lungs, sufferers developed a chronic cough. It was known as Consumption because its victims would lose weight and literally waste away. Before the discovery of antibiotics, Tuberculosis was incurable, and people with the disease would be isolated in sanatoriums and other "homes for consumptives." By the early 20th century doctors and scientists were finally beginning to understand how the disease spread and there was a call for greater preventive measures. Dr. Carl Horber, Secretary of the Tuberculosis Commission in Zurich, embarked on a plan to unite the several thousand Swiss charitable organizations with child welfare missions. He reasoned that among the other benefits of unity, a single organization could more effectively champion prevention campaigns. Pro Juventute was born. Horber approached the Post Office and made arrangements to issue a special stamp to raise awareness and help finance the fledgling organization. The notion of raising funds with stamps and stamp-like labels was not new. During the United States Civil War, Sanitary Fair stamps were sold to support the care of Union Troops. Although they had no postal value, they were used on mail alongside regular stamps. Perhaps the most famous stamp-like labels are Christmas Seals, first issued in Denmark in 1903 as part of that country's anti-Tuberculosis efforts. The term semi-postal is used by collectors to describe a stamp that has both postal value and raises charitable funds. The first semi-postal stamp was issued by the Australian state of New South Wales in 1897 to raise money for a home for consumptives in Sydney. The first Pro Juventute stamps were sold at Post Offices between December 14 and December 31, 1912. There were three stamps issued each using a different language: German, French and Italian. The 1912 stamps were not valid for postage but were denominated at 10 rappen - more than 1.2 million were sold. Because they were not valid for postage, the 1912 stamps are often referred to as forerunner Pro Juventute stamps. The forerunner issues are typically not found in philatelic catalogues, which have long established guidelines and only list valid postage and revenue stamps. 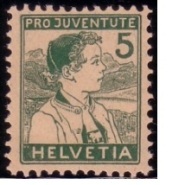 In 1913, Switzerland issued the first true semi-postal Pro Juventute stamp. Interrupted by war, there were no Pro Juventute stamps in 1914, but production resumed in 1915 and has continued uninterrupted to this day. 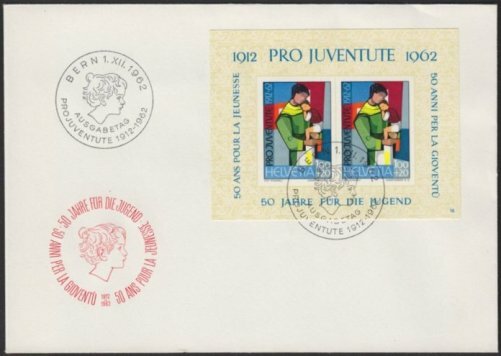 of the founding of Pro Juventute along with several special commemorative cancels. Philatelists will be interested to note some of the changes the program has undergone over the years. The first issue was valid for only a brief period of time - December 1, 1913 to February 28, 1914 - as was printed directly on the stamps. Subsequent issues did not print the validity period on the stamps and over time that period was gradually extended. From 1917 to 1928 stamps were valid until April 30 of the following year. In 1929 the validity was extended to May 31 and since 1964 Pro Juventute issues have had unlimited validity. Also of note is the fact that prior to 1921, semi-postal stamps were not valid on international mail. 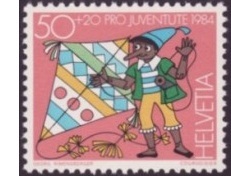 This was a restriction of the Universal Postal Union, and it was largely a response to Pro Juventute that the regulations were changed allowing charity and other special purpose stamps to be used internationally. Over the years, the stamps have featured a variety of topics, typically embracing Swiss themes and highlighting the works of Swiss artists. The topics often run in series across multiple years. Landscapes, Swiss personalities, traditional costumes, toys, characters from literature, flowers, insects, birds and wild animals are some of the highlights. More recent years have seen the inclusion of one stamp each year with a specific Christmas theme and the selection of stamp images from the drawings of children. For the better part of 1,000 years, merchants have gathered at the Leipzig Trade Fair to sell their wares. In modern times the Leipzig Fair (Leipziger Messe in German) has produced a wealth of philatelic collectibles including stamps, covers, collector cards, and cancels. There is no more iconic emblem of the stamp collecting hobby than the Inverted Jenny. The 1918 United States bi-color error features a blue Curtiss Jenny airplane, upside down in a red frame. The dramatic nature of the error and its storied history has left the Inverted Jenny as the world's most recognizable stamp. On March 31, 2011 Japan Post issued two sheets of stamps to commemorate the 40th anniversary of the Japanese-language publication of The Tale of Peter Rabbit. The twenty stamps making up the series depict some of Beatrix Potter's most memorable and beloved scenes and characters. Issued on January 4, 2009, this stamp issue from the Republic of Belarus celebrates Louis Braille. Having lost his sight at the age of 3, Braille went on to invent a writing system based on raised dots that brought reading to blind and vision-impaired people around the world. Issued beginning December 1918, the first stamps of Czechoslovakia offer an affordable treat for the philatelic specialist. Known as the Hradcany issue, there are five basic types accompanied by a wealth of variations in color, paper types, perforations and plate flaws.